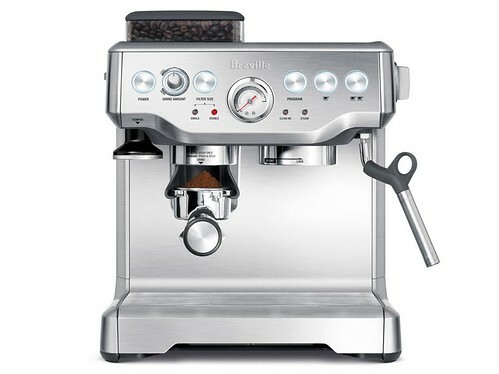 The Breville BES860XL Barista Express™ — all that’s needed to make the perfect espresso drinks in one compact station. We know that espresso lovers will go to great lengths to refine the art of making espresso. They will experiment with flavors and adjust the grind of the beans and the tamp in search of the perfect espresso. With the Breville Barista Express™ and its integrated coffee grinder, making that perfect fresh espresso has never been simpler. You can be the barista and explore the art of espresso at home. A. FILTER SIZE button - select between SINGLE or DOUBLE SHOT. B. SINGLE or DOUBLE SHOT lights - illuminates to indicate whether a single so double shot filter is selected. C. GRIND SIZE Dial - Select the preset DUAL: WALL setting when usi9ng Dual Wall Filters or adjust the grind to a finer setting when using the Single Wall Filters. D. POWER Button - Surround illuminates when the button is pressed to 'On'. E. Integrated/Removable Tamper - for expert tamping control. 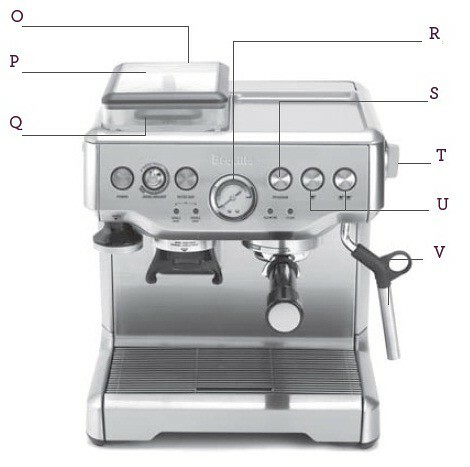 F. GRIND AMOUNT Dial - controls the amount of freshly ground espresso dispensed into the filter. Select the DUAL WALL setting when using Dual Wall Filters. G. Hands Free Grinding Cradle - Push portafilter into cradle and freshly ground espresso will be dispensed directly into the filter. H. Cup Warming Tray. I. CLEAN ME Light - indicates when a cleaning cycle is required. J. STEAM Light - illuminates to indicate that the steam function is selected. K. Group Head. L. Forged Portafilter - commercial style with extended outlets, holds the selected filter in place. M. Removable Drip Tray - with coffee grinds separator. N. Drip Tray Full Indicator. O. Removable 67 oz. Water Tank - with water filtration system. P. Sealed Bean Hopper: 7 oz. Capacity - hopper locking system allows removal of hopper without removing beans. Q. Integrated Conical Burr Grinder - adjustable to achieve your perfect grind. 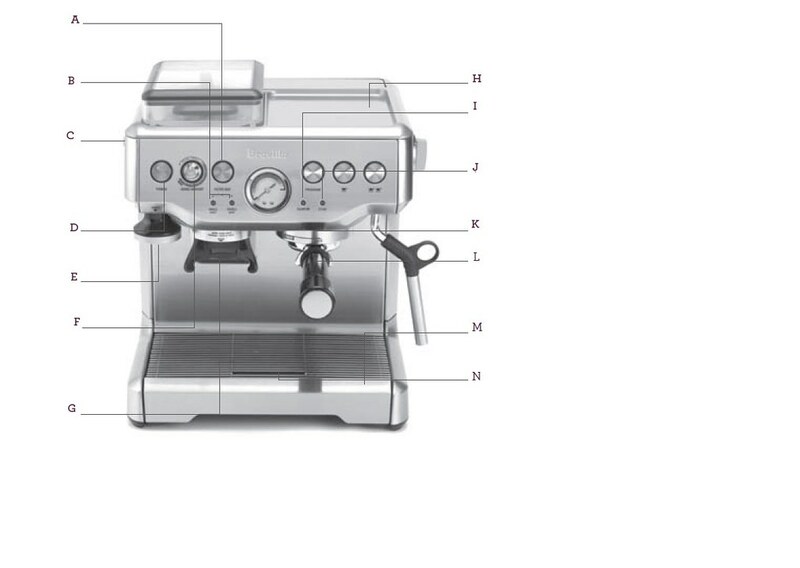 R. Espresso Pressure Gauge - Monitors extraction pressure, guiding you towards the ideal espresso. S. PROGRAM Button - personalize the shot size to suit your preference. T. Steam Dial - selector control for steam. U. Preset Shot Size - Single (1oz.) or Double (2oz. ), approximately. V. Swivel Steam Wand with Frothing Attachment - easily adjusts to perfect positioning for steaming and frothing milk. Cleaning Tool, Cleaning Brush, Cleaning Tablets, 54mm Cleaning Disc, Coffee Scoop, Allen Key (for removal of the shower head for cleaning and maintenance). Dual Wall Filters 2 are included, 1 Single Shot and 1 Double Shot. Single Wall Filters 2 are included, 1 Single Shot and 1 Double Shot.